You may think that there is little interesting about a dishwasher these days, after all they wash dishes and cutlery for you. Pretty simple concept, but when is a dishwasher not a dishwasher? 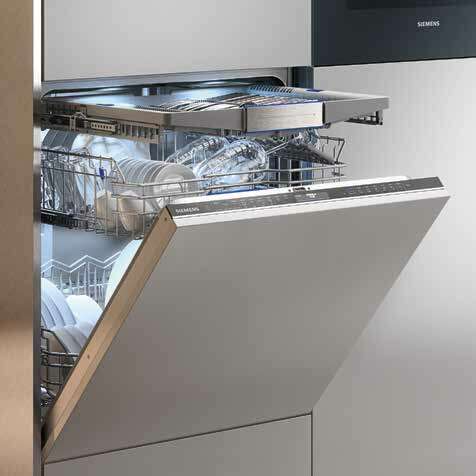 When it’s a SX878D00PG Fully Integrated Dishwasher with varioHinge is the answer. One of the biggest advantages of this dishwasher is the utilisation of Zeolith technology, which is actually a very fancy piece of kit. The basic premise is that Zeolith is a naturally occurring mineral which has the unique properly of converting water into heat energy. It does this without any additional power, which ends up saving you a fair bit of electricity. When the opportunity to be more green arises, we should take it. Are you a wine fan? The SX878D00PG offers the delightfully classy addition of a wine glass holder. As you can imagine, this accessory is designed specifically for holding your wineglasses effectively and securely. You’ll never have to wash one by hand ever again! What’s more, this is included with every single studioLine dishwasher as standard. No hidden costs. Our personal favourite little feature, whilst a small one, is the projected timer display. Exactly as it sounds, the timer is displayed on the floor directly in front of the dishwasher. This is particularly useful because studioLine dishwashers are incredibly quiet, to the point where you won’t be able to tell if they are running or not! Whats more, this so called timeLight never needs changing and will last the entire lifetime of the appliance.